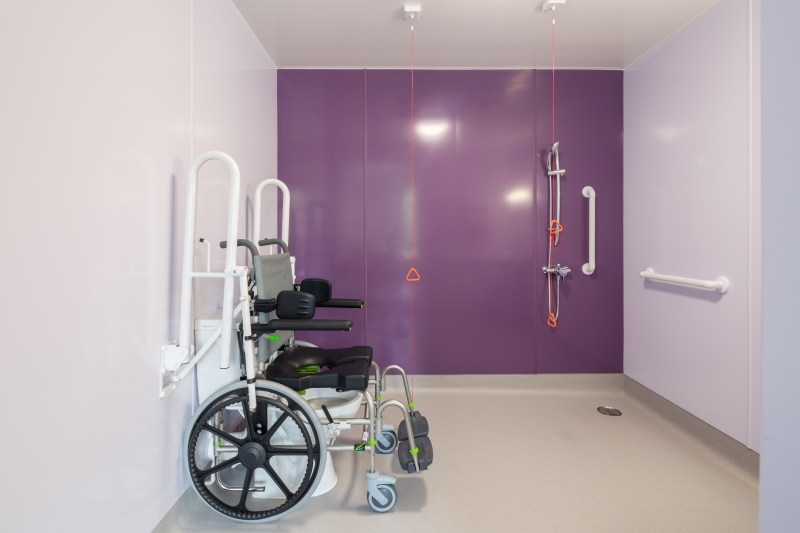 An integrated package of Altro floors, walls and ceilings has been installed in a new flagship spinal injury centre in Dorset. 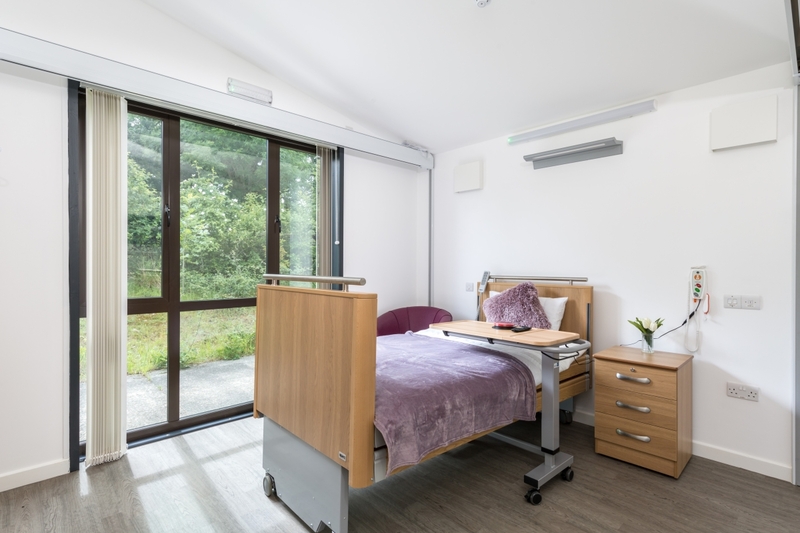 Livability Holton Lee, run by the charity Livability, has recently undergone a total refurbishment, carried out by contractor, Stepnell, which transformed the existing care home into a wellbeing discovery centre and purpose-built spinal injury unit. This provides respite and rehabilitation services to people with spinal cord injury, offering both short-term residential and drop-in care. 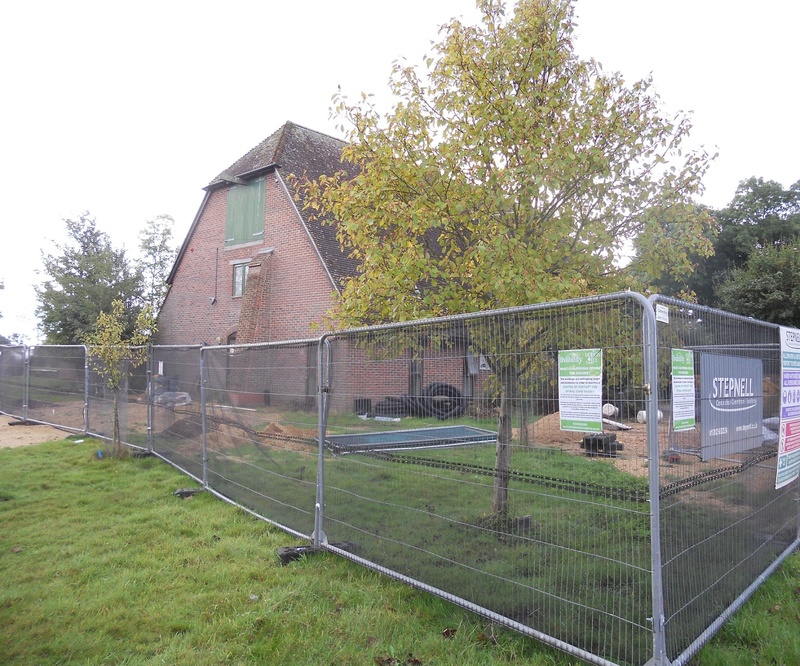 A spokesperson for the Livability estates team explains: “The spinal injury centre is a flagship facility for Livability and part of the formal pathway of care for people who need spinal injury support. The decision to use Altro surface products was made by Livability in partnership with Altro, Elite Interiors, and Western Design Architects. The charity spokesman said: “The design team was all very much of one mind in that we wanted to create a feel-good ‘wow factor’, with a warm, homely colourful look, which was non-clinical and used contrasting designs and colours to be both decorative and to help with wayfinding and accessibility for those with visual impairments. The homely-yet-professional theme was continued for the wet rooms and en-suite bathrooms in the spinal injury unit. “These are private areas where people need to feel comfortable and relaxed during their stay, but safety and hygiene are also key,” said the spokesman. 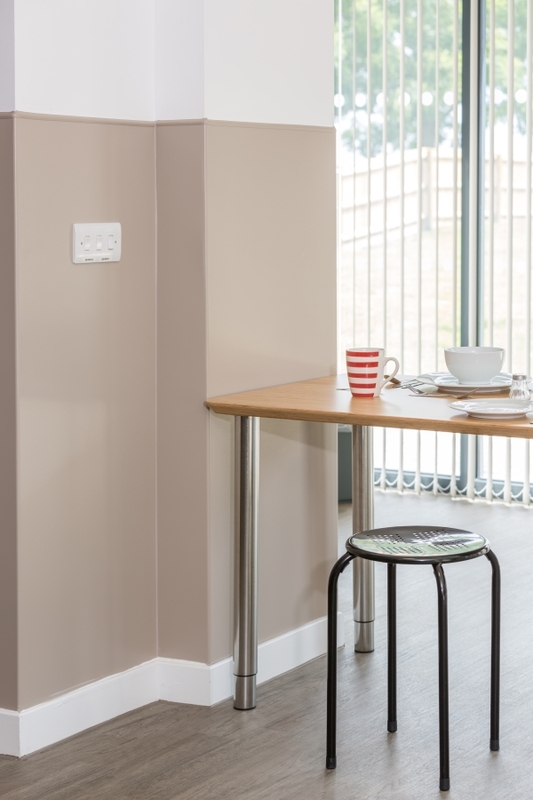 “For the floors we chose Altro Pisces, an excellent safety surface for wet environments because it performs in wet or dry and with bare feet or shoes so is ideal for both staff and residents. The team chose a pale lilac called ‘Malva’ for three of the walls, and a powerful dark rich purple called ‘Viola’ for one statement wall. Once the design team had selected the Altro products, Western Design Architects went away to bring our vision to life, design the interior, and create a CAD model so the team could picture what the finished article would look like. Jonathan Turvey, director at Western Design Architects, said: “The common language of those designing the look and ethos of the new spinal unit was that it should never look like a hospital and should feel welcoming and warm. “The clever use of different Altro flooring colours and designs to differentiate between the walls and floors ensures that wayfinding in the unit is clear, but also in keeping with the overarching colours and themes, so it never compromises the design. 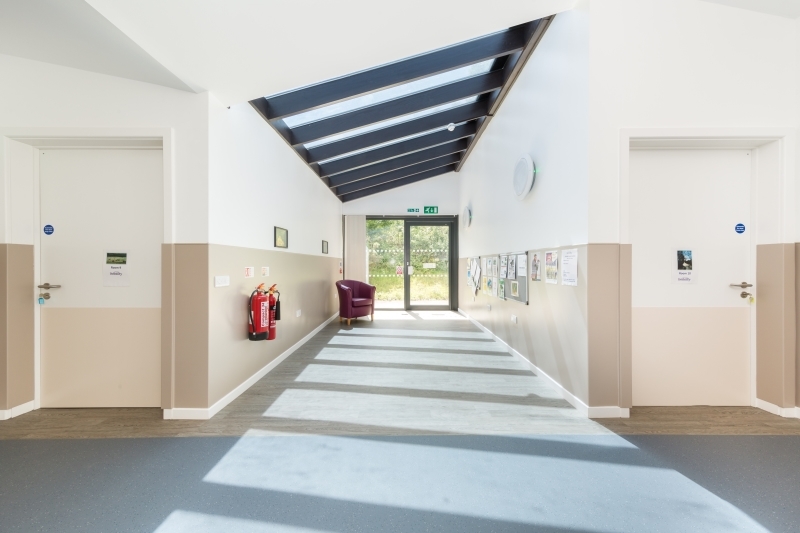 “We also wanted to create a strong contrast between the communal and private areas, using Altro Wood Safety flooring in bedrooms and strong Altro Whiterock colours in the bathrooms. The unit’s service manager and a fellow of the Royal College of Nurses, Fiona Stephenson, adds: “First impressions last a long time, and the unit has a very powerful ‘wow factor’ that stays with you. “It looks stunning; fresh, clean, welcoming, cheerful, stylish and comfortable; all the things the people who come here need. “The wayfinding using the two types of flooring works so well. It creates a flow in the whole facility and also keeps the colour scheme consistent. It’s subtle, yet very effective. Everyone loves the bright-purple walls in the bathrooms, which are very striking and something you might choose for your own home. Altro products were used elsewhere in the unit, too. Altro Stronghold 30 specialist safety flooring was used in the kitchens and food servery, while Altro’s wall protection system provides a much-needed solution. The Livability spokesman said: “There is a lot of traffic in the unit, from wheelchairs, trolleys and other equipment that could potentially damage the walls.